Did you know that rhubarb doesn’t grow everywhere? That’s just about the saddest thing I’ve ever heard. As a lifelong Minnesota girl, I absolutely adore rhubarb—it’s one of the very first things to grow here after our long winters, and we sure enjoy using it in every way we can. 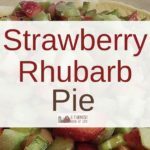 Let me share with you my favorite rhubarb crisp recipe. Why is it my favorite? Because, one word: butter. Put the cup up rhubarb in a bowl and sprinkle with 1 cup of white sugar, 1/2 cup of flour, and 2 tsp. cinnamon. Mix until the rhubarb is well coated. Pour this into a 9×13 cake pan. Next it’s time to make the topping — and this is where the magic is. Did you catch that the topping has 3 sticks of butter in it? 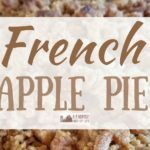 Place all the topping ingredients into another bowl and cut the butter in with a pastry blender until the butter is evenly distributed and the mixture is pretty crumbly. Pour the topping on top of the fruit in the 9×13 pan. Admire how lovely it looks, that shameless butter filled topping. My word, mama. Is your mouth watering? Because mine is. Pop that beautiful creation into a 350 degree oven for 60-70 minutes until the top is lightly browned and the fruit filling is bubbly. Actually, wait. Let it cool ever so slightly, then put some ice cream on it, and then you eat it. Post pictures on Facebook eating this rhubarb crisp, declaring that it’s the best thing ever because 3 sticks of butter makes the best crisp topping. Or, you know, invite people over to share it with you. But if you don’t, I’ll never tell. 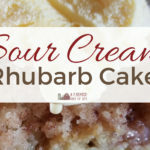 My husband’s favorite rhubarb treat is strawberry rhubarb pie, but he’s also taken a liking to my sour cream rhubarb cake. And while I’m all about baking all the things, sometimes it’s too hot to bake when the rhubarb is ready. In this case, my go-to recipe is strawberry rhubarb slush—a lovely summer icee of sorts that can made with or without alcohol. Enjoy rhubarb season. It’s not nearly long enough, but it’s welcome every single year. My favorite rhubarb crisp recipe: simple to make, and shamelessly delicious because of one word: butter -- and lots of it. 1. Put the rhubarb in a large bowl and sprinkle with 1 cup sugar, 1/2 cup flour, and 2 tsp cinnamon. Mix until rhubarb is well coated. Pour rhubarb into 9x13 pan. 2. Place all other ingredients in big mixing bowl and cut the butter in with a pastry blender until butter is evenly distributed and mixture is crumbly. Pour on top of rhubarb in pan. 3. Bake in 350 degree oven for 60-70 minutes. 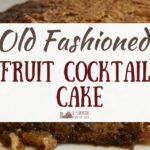 Top should be browned and fruit filling should be soft and bubbly. Enjoy!